Left-handed pitcher Tom Gorzelanny, who pitched the last two seasons with the Milwaukee Brewers, signed a one-year deal with the Detroit Tigers today. The 32-year-old Gorzelanny missed the first two months of the 2014 season while recovering from off-season shoulder surgery. He eventually returned to the lineup and made 23 appearances out of the bullpen, posting a 0.86 ERA. In two seasons with the Brewers, Gorzelanny went 3-6 with a 3.30 ERA in 66 games, including 10 starts in 2013. The Brewers announced today that former player and current TV analyst Bill Schroeder will be enshrined on the team’s Wall of Honor at Miller Park in 2015. The Wall of Honor commemorates players and broadcasters that meet a set criteria based on service to the club. Schroeder will be honored during a pregame ceremony on Friday, July 17 when the Brewers face the Pirates. Tom Gorzelanny had a solid start to the season in the Milwaukee Brewers bullpen. 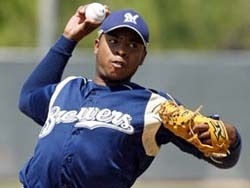 The results have been mixed since he joined the Brewers starting rotation. Last night, Gorzelanny worked just 5 1/3 innings, allowing 4-runs on 9-hits as the Brewers fell to the Pittsburgh Pirates 7-1 at PNC Park. The St. Louis Cardinals jumped out to a 7-0 lead and held on for a 8-6 win over the Milwaukee Brewers at Miller Park. Carlos Beltran and Allen Craig both clubbed long home runs and Cardinals pitcher Jake Westbrook clubbed a 2-run double to provide the initial cushion. But Westbrook struggled to protect that lead, serving up a 3-run homer to Aramis Ramirez and eventually departing before the 5th inning. for the first time in four tries this season. 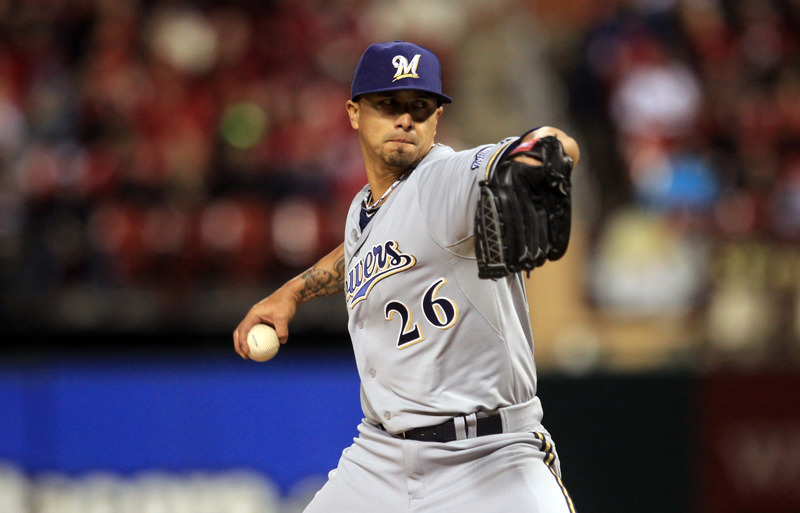 Lohse worked six innings in the Brewers 6-3 win over the St. Louis Cardinals at Miller Park. Lohse allowed six-hits, struck out four and walked two to improve to 9-8 on the season. Lohse entered the game with an 0-3 record and a 5.00 ERA against the Cardinals this season. Jordan Zimmerman (Auburndale, Wi. native) earned his career best 13th win, helping the Washington Nationals knock off the Milwaukee Brewers 4-1 at Miller Park on Friday night. Zimmermann (13-6) went 12-8 in 2012 in 32 starts. Last night’s win came in just his 22nd start. Zimmerman worked six innings, striking out four and walking four. The Brewers only run came on Jonathan Lucroy’s solo home run off of reliever Tyler Clippard in the 8th inning. The Brewers finished the game 0 for 9 with runners in scoring position. Bryce Harper clubbed his 16th home run of the season in the sixth inning and drove in another run when he reached on an error in the 9th. Brewers starter Tom Gorzelanny had to leave the game in the second inning when he took a line drive off the bat of Jason Werth. The ball struck Gorzelanny on the arm. The Brewers said Gorzelanny has a left elbow contusion and X-rays were negative. After Thursday’s off-day, the Milwaukee Brewers (46-62) are back on the field tonight as the Washington Nationals (52-56) visit Miller Park for the first of three. Milwaukee is coming off a seven-game, six-day road trip there they posted a 4-3 record. Among those wins, three came against the Chicago Cubs (49-59). Milwaukee was able to cut the deficit down to 3.5 games as they try to catch Chicago and get out of the basement in the National League Central. On the mound tonight for the Brewers is Tom Gorzelanny (2-4, 2.83 ERA) who makes another start after starting the year in the bullpen. Auburndale native and former UW Stevens Point Standout Jordan Zimmermann (12-6, 3.19 ERA) takes the mound for the Nationals. Zimmermann has one career start at Miller Park where he allowed just 1-run in 6-innings while picking up the win. Tonight’s first pitch is 7:10. In the midst of all the reaction to Ryan Braun’s suspension, the Brewers still had a game Monday night. The result was also not good for Milwaukee. The Brewers opened their four game series with San Diego falling 5-3 to the Padres at Miller Park. The loss snapped Milwaukee’s four game winning streak. Tom Grozelanny was solid up until the 6th inning. He surrendered 4-runs in the frame squandering Milwaukee’s 3-1 lead. He finished allowing 5-runs on 5-hits in 5 2/3 innings of work. Padres pitching allowed just 4-hits on the night. Starter Andrew Cashner gave up 3 of them while allowing the 3-runs in 6-innings. Nori Aoki had a pair of hits to lead the Brewers offense while Jean Segura drove in a pair of runs on the night. The Brewers and Padres meet again tonight for game 2 of the series. Donovan Hand (0-1, 3.27 ERA) takes on Tyson Ross (0-4, 3.60 ERA) for a 7:10 first pitch. The Milwaukee Brewers opened their four game series with the Arizona Diamondbacks on the losing end of a 5-3 decision Thursday night.